I’ve recently stumbled upon two blog posts that got me thinking about agile adoptions and why they might fail (not in a safe way). First there was this post that I saw because it resonated with a colleague and he shared it. I don’t know Guillaume and I’m sure he is a very nice guy, but the post struck me as from someone who didn’t understand the Agile Manifesto and was confusing it with the prescriptive guidance in the Scrum Guide or the guidance of The Lean Startup. And then I saw a post from my friend Dylan Smith starting a blog series about “Why Does Agile Fail”. As I was reading these two posts, I started asking myself Why are these authors making these statements? Why are they observing these effects? The way that I’ve understood the Agile Manifesto and its intent, you shouldn’t see these effects, at least not for very long. It struck me though that this is a story that I hear over and over again. Then I had a light bulb moment. We often talk about an “Agile Buffet” as a set of tactics or practices we can pull from and use as best fits within our organization. I like this. As a passionate Kanban Method practitioner, the idea that we’ll continuously discover problems opportunities for improvement and that we’d want to leverage past industrial learning is a core philosophy for me. But the Agile Manifesto is NOT a buffet. We should not pick and choose which of the values and principles that we will follow and aspire to. They are all necessary ways of thinking if we’re going to pull our industry out of the dark ages. Now I am not suggesting we shouldn’t be finding the best way to, in context, live up to those values and principles. We should be very disciplined in What we pull from the Agile Buffet and When we pull the improvement. This is where a Kanban Method approach to continuous improvement is enormously beneficial. With a functioning kanban system, we have data that allows us to make informed, economically sound decisions about improvements and a mindset that we are going to improve incrementally and in an evolutionary manner. We are actually slaying a software development dragon with a 1-2 punch of Agile Manifesto thinking and Kanban Method thinking. We’ve got something guiding us towards what a successful software development team would behave like (Agile Manifesto) and we’ve got something showing us how to get to that goal in a humane, intelligent, and economic manner (Kanban Method). I would like to encourage you to go read the Agile Manifesto again and to go read about The Kanban Method. They won’t tell you how to do things, but they are telling you what you should aspire to do. Now with that in mind, go and look at the Agile Buffet. Read the Scrum Guide. Read the kanban blue book as well as look at case studies from teams that have used the Kanban Method. This is your buffet of tactics that can help you solve your problems. Start pulling from this buffet of industrial learning. Develop a capability to understand what works for you and perhaps more importantly what doesn’t. But please remember, these value systems are not a buffet and you don’t get to pick and choose from the values and principles they provide. Wow! I just got back from #Agile2013 in Nashville and I have to say it was a great experience and my brain is overflowing with ideas! Which is always good for blogging. The people from SAFe are at the Agile Confernce this week. They had no where else to go, since RUP and waterfall don't exist. Be polite. @agustinvillena i think there is no question it should be. is in our kanban. What do they say it is in LKU Kanban? New Blog; Kanban - an alternative path to agility djaa.com/kanban-alterna… To tie in with our exhibit & PR during #agile2013 in Nashville! So we have a lot of posturing and positioning, and I actually don’t mind that. With noise comes interest, with interest and curiosity comes exploration and learning, and we can all grow. I hope though that by reading this blog and the other blogs and by exploring the topic, you gain a greater understanding of the items under discussion. It was with this intent that I had a really good conversation (or two) with Al Shalloway and Nayan Hajratwala about SAFe and the current thinking about The Kanban Method and Kanban/kanban in general.
.@alshalloway I'd be happy to talk to you about if or when to optimize WIP Alan. #agile2013 We can talk at @Open_Jam if you want. Today I had a realization about the experience. I learned about SAFe. I learned more about Scrum. I expanded my own understanding of The Kanban Method and kanban in general and I discovered more refinements to my thoughts when having this conversation! The Kanban Method, as David has been saying and said in the post above, is not the enemy of SAFe or Scrum or any other practices-based methodology that is a manifestation of the Agile Manifesto. It isn’t even comparable. It isn’t an Agile-practices based methodology at all, which is why David (and many of us at LKU) have been saying that The Kanban Method isn’t an Agile methodology! It is the vehicle that GETS you to Agile, wherever that may be for you! It is the vehicle that you use to encourage a collection of weird-acting individuals (people in an organization) to do something, such as adopt a bunch of agile-influenced tactics that might be described within any of the other practices-based methodologies! Let me draw a picture! We all start on these process adoption/organization transformation/improvement initiatives from a current state. Very often we can’t even describe the current state, but that is where we are. And very often, we can’t accurately describe the desired end-state, but let’s suggest for a moment that we can. So we know where we are (maybe) and we know where we want to go (maybe) but how to get there?!?! Some folks would have you believe you can jump there by telling the organization to put something in place. I don’t mean to pick on Scrum. I like Scrum when it is the right fit. But it is frequently adopted blindly and prescriptively because it provides a lot of guidance on specific practices. But what if Scrum doesn’t fit? (Are there any DevOps people reading?) What if Scrum doesn’t help with the capability that you’re interested in? Or what if you’re problem is a scaling it out problem, which Scrum has troubles with. Good news! SAFe is right around the corner!! And virtual kanban systems! And Random Acts are there too!! 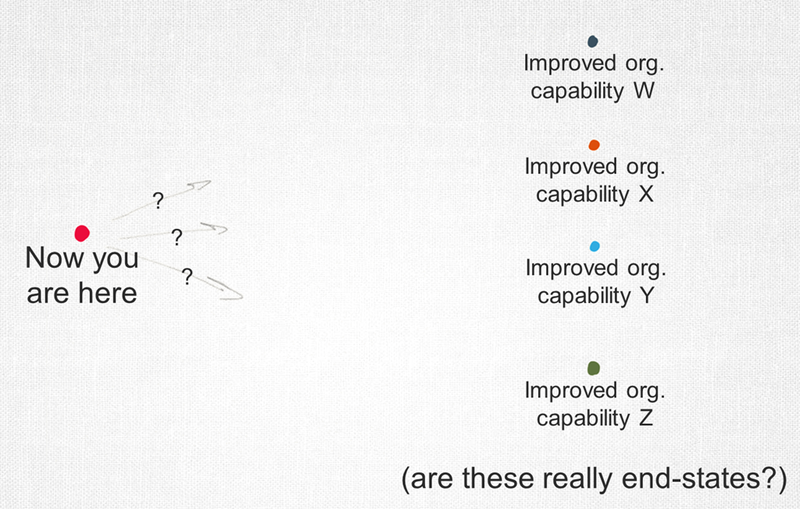 These are all methodologies with some great tactics to use for organization improvement right?! If you just tell everyone to do Scrum, SAFe, virtual kanban, or random stuff (heros, cowboys and smart people), we’ll achieve the improvements we’ve been struggling to get for the last 50 years in our industry!! But I heard this awesome comment from Linda Rising at #Agile2013 during her talk. I forgot to attribute it to her in my tweet though! This is part of the problem with prescriptive approaches to process adoption. And unfortunately, Scrum and SAFe as described are easily prescribed. I’d even venture to state that the authors and evangelists of these methods want them prescribed. “If you do this, everything will be ok.” Of course they will not admit that they want you to blindly adopt all of the tactics, but in my opinion, the way those methodologies are described and evangelized, that is how it works out in the end. And never mind that we still don’t really know if the methodology that we’ve selected will get us to the desired improvement given the context in which we are applying the methodology! Do the people in your organization want Scrum? SAFe? virtual kanban systems? Will they be able to pick up all the necessary practices? Apply them properly? Will the organization have the maturity to get through the hard parts? What if you’ve picked the wrong method? And what if the actual end-state option that you need isn’t the one you thought you needed at the start? Has this happened to you? Have you seen this happen? I want to reiterate at this point, I don’t think that the practices and tactics described in Scrum are bad. I don’t think SAFe tactics are inherently bad. 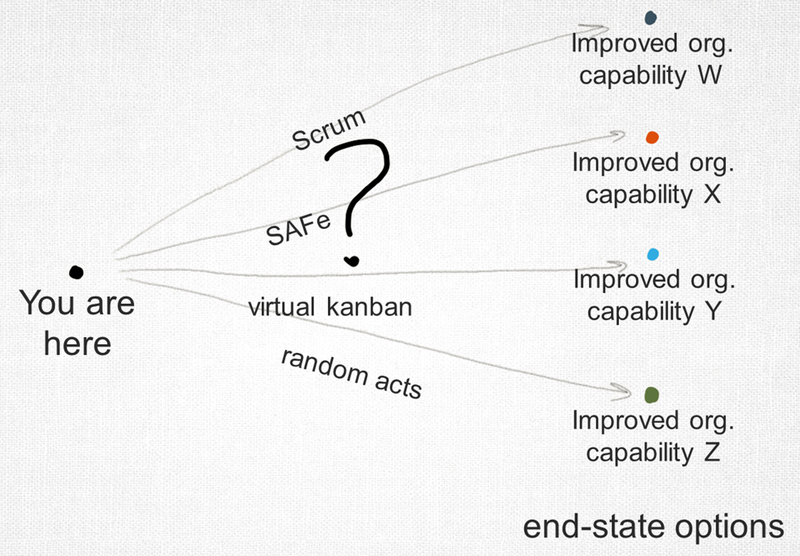 I don’t think that “Kanban is so easy” crowd (proto-kanban or basic virtual kanban systems) are bad. It’s just going to be harder, longer, and more costly to get to an end-improvement than it should have been. 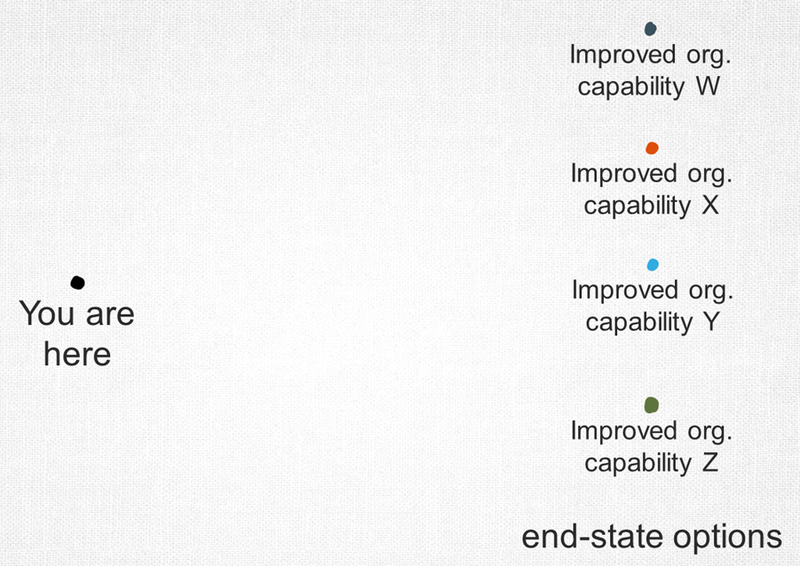 You’re increasing the chance of your improvement initiative being interpreted as a failure, or being aborted early. Or leaving improvements undiscovered! Another thing that I think is really interesting is that most of the practices-based methodologies describe themselves as an end-state. Like there is no more to learn and no more reason to grow in your context. 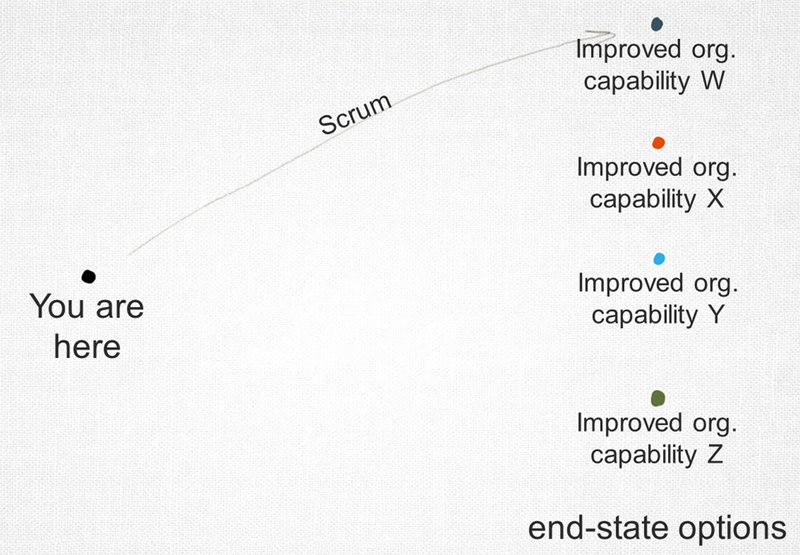 What if the discovered end-state is a healthy, functioning Scrum implementation. Is that the end? Is there no where else to improve? What guidance does Scrum give you if you find an improvement that is counter to a described Scrum tactic? Or SAFe for that matter? Should we have end-states? I think we are far better served trying to create an organizational capability to identify improvement opportunities and use any/all available tactics that we think will move us towards the desired improvement, once we know what the specific problem is. I think we are better served by creating an organizational capability to understand the attributes of the work that we do (volume, frequency, size, complexity) and understand the capability of the organization to execute that work. And I think that we are better served by facilitating the creation of a kaizen culture within the organization that will continuously seek out opportunities to improve because then the people own the problem and the improvement! I want a vehicle to get me to my currently planned destination!! I want to be able to make informed decisions and change the destination! I want all my peers to dynamically guide their team to the next improvement that is discovered in the context of doing the work! And I don’t want to limit my destinations! I want to know that I’m making progress! So we know you’re organization is ‘here’! Sounds silly when you say it that way but even if you can’t describe it, you are where you are. And there is some value in describing where you are because it will make progress measurable and discrete instead of abstract or qualitative. And we know that we need to be… faster let’s say. It should be more elaborate than that but bear with me for a moment. Now we have to convince everyone involved to paddle in the same direction! What can I use to do that? Will Unit testing help? Will team structures help? continuous delivery? project roll-up techniques? Will any of these specific practices help me create an environment that causes groups of people to understand the problem, understand the capability, formulate a plan to improve and then determine if the execution worked? I do not think so. Are they all good things? YES! Unequivocally! Are they good things for everyone? All the time? No. The Kanban Method will foster these capabilities for you because that is what it is designed to do. It is not designed to make you code faster or with higher quality. It will help you understand the cost of poor quality and then allow you to experiment with quality improving tactics like Unit testing/TDD/ATDD/BDD/xDD. Will it help you deploy your application faster or sell more units of your product? No, you have to use tools or LeanStartup for those kinds of things! Will it help you create a kaizen culture within an organization? Yes, because that is what it is designed to do. Will The Kanban Method encourage you to adopt concrete practices from any other methodology? Yes. Can you use a SAFe tactic if it seems logical in your context? Yes! Scrum tactic? Yes! virtual kanban system? Absolutely! I keep coming back to something that my friend Frank Vega has said numerous times. It was because of the disagreement that Alan Shalloway and I have about how we should guide people that I had these conversations. It was because of the respect and curiosity that we both have that we continue to meet at this boundary. It think it is important though to be clear and compare like things. The Kanban Method is not an Agile Manifesto-inspired practices-based methodology like Scrum or SAFe. It is an approach that is intending to create a capability within organizations to do incremental, evolutionary improvement. It is a transition method that understands people and the various factors that cause people to disengage. It is a transition method that provides high-level guidance for the creation or adoption of specific practices in a situation where a problem has been identified. It is a transition methodology that sees no end to the improvement cycle and as such, does not provide guidance on concrete tactics or the order in which you adopt concrete practices. 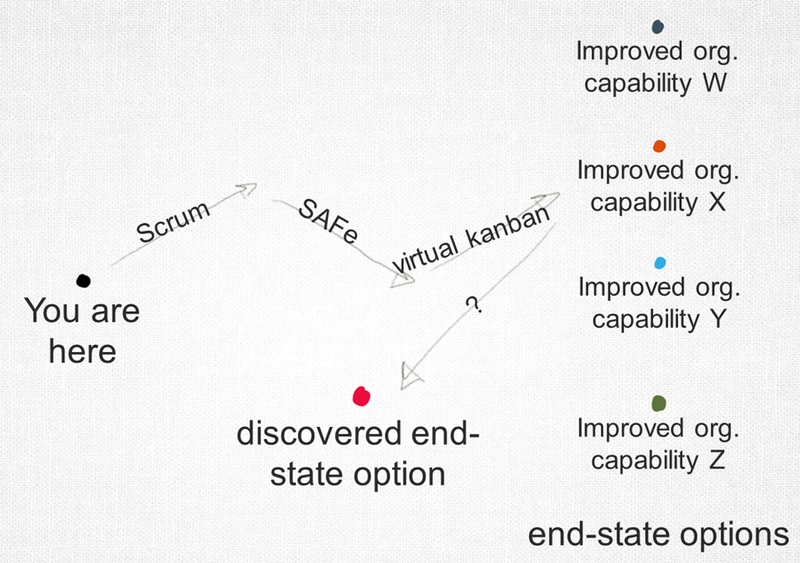 And because of the opportunistic nature of the culture created by a Kanban Method implementation, all the specific practices that are described by Scrum, SAFe, XP or RUP for that matter, are viable improvement options to specific problems that you may encounter on your journey of continuous improvement. So get in your vehicle, start improving and go until you hit the horizon!